Rui's art is inspired by the positive vibes and beautiful wildlife in Africa. Curious to know how these prints were born? Read about them below! This composition, inspired by countless visits to Nairobi’s Giraffe Center and many minutes staring into big, gentle eyes, merges the curious look of a giraffe with cool-blue banana leaves onto a bold, saturated yellow background. The image recalls the warmth of sunny Nairobi and Rui’s childhood home garden, dotted with banana trees. The name Kangarui combines the khanga—the most classic East African textile—and Rui’s name. But kanga is also the Swahili word for the guinea fowl, the white-dotted, blue-faced birds that roam in the Kenyan wild. This design, and the beautiful bird itself, embodies the rich spirit of Kangarui: multi-cultural, positive, and energetic. While we don’t see toucans in Africa, they are irresistibly interesting birds. Rui could not help but to capture their bizarre, bold features, using their large beaks and beautiful plumage as a canvas to experiment with interesting surface textures. Charming and sweet, this print will no doubt put you in a cheerful mood! As a child, Rui had almost a dozen chameleons as pets. She would feed them a couple times a day, let them perch on her head, and go for walks. These slow, kooky creatures seem unassuming, but they would always find a way to disappear into the wild. Remember when dinosaurs were all the rage? Stoic, grand, majestic, these creatures captured many young imaginations, and Rui was no exception. Drawing on the sensitivity and gravitas of dinosaurs that so easily enamored a generation, Rui challenged herself to recreate this in a modern-day animal. 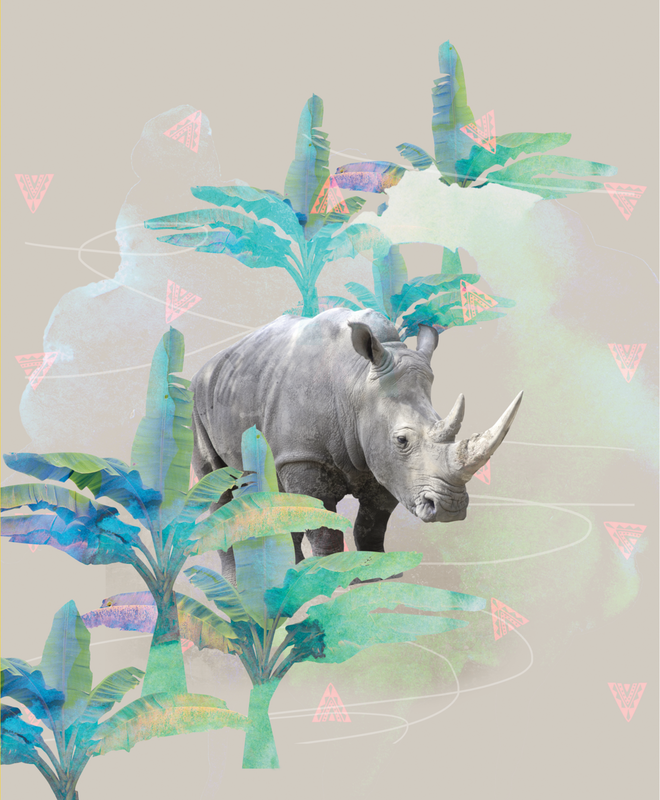 Rhinos are the perfect contemporary “dinosaur!” This design is the resulting visual daydream: what would it be like to find a rhino traipsing in a tropical jungle? For this zingy design, Rui offset a crowned cheetah with vibrating tessellations and flat orange segments for a fresh look that recalls the frenetic bursts of energy that cheetahs are famous for. Of the Big Five, leopards are surely the most difficult to find—and if you are lucky enough to spot one, you’ll remember the moment. For Rui, it was in Samburu, the leopard settled in between branches of a yellow acacia tree, gazing unabashedly right at her. Here in this design, she recreates that midnight gaze. 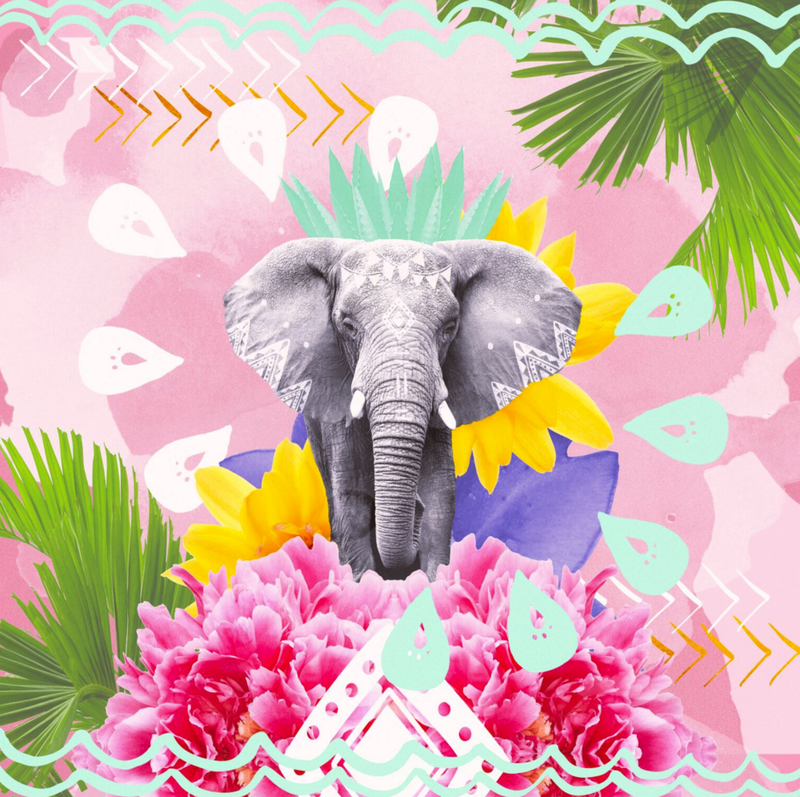 We all know that elephants are powerful and majestic, but in this design, Rui plays with the cheerful, jestful sides of these Kings of the Savannah with a whimsical starburst of flora and symbols. Through visually dynamic elements, she considers the balance, even mutual respect, between this natural king and his kingdom. With their deliberate movements and majestic stature, lions seem to emanate confident energy. In reality, they’re pretty lazy and leave most of the hunting to lionesses… but we can still admire and give the King of the Jungle the saintly aura it projects. Doubtful anyone has called water buffalo the savannah’s most beautiful animals. But Rui remembers the time she saw a lone buffalo emerging from a good, deep dip in a puddle: looking shocked, embarrassed, and suddenly shy when he noticed he was watched! That charm is unforgettable. Rui grew up in a house overlooking Lake Nakuru, where, from the living room window, she often watched thousands of flamingos color the lake pink. While, sadly, the number of birds has vastly decreased in the past couple of years, those pink flocks represent one of Rui’s favourite memories from her childhood. 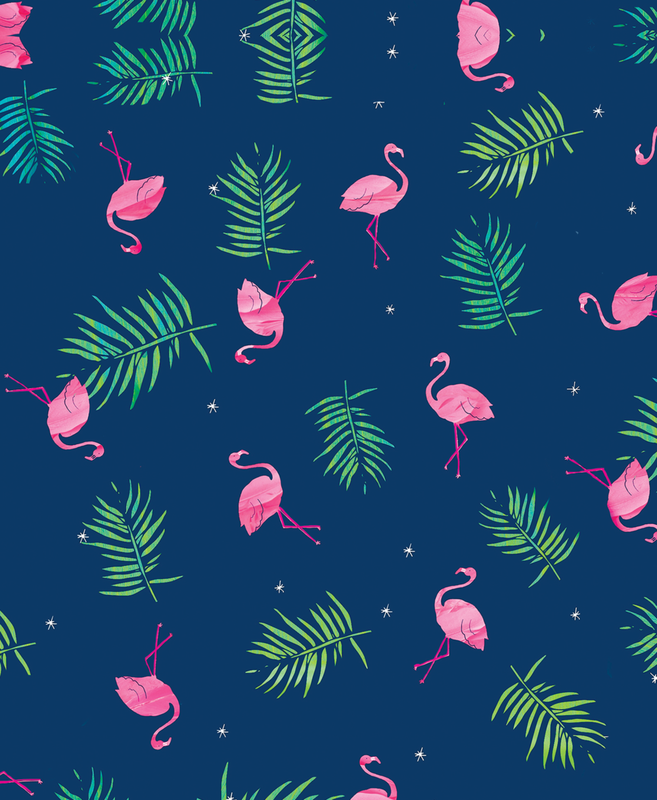 She revisits those windowside memories in this design, decoupaging hand-drawn flamingos using actual photographs of their pink feathers. With a tiny tail that never seems to stop swinging, impalas are lively and adorable. Rui surrounds the impala with her favorite flowers she had in her childhood home to enhance the Impala’s pretty features. In an area by Mount Kenya inhabited by few other living organisms, Rui was on a walking safari when she came across a few big, bold cactii. There was something about the loneliness of the environment around them that made them seem strong, tough, and independent to her, so she folded that up into a simple composition. The warm coral paired with faded blues and greens gives the prickly plant a bit of softness.